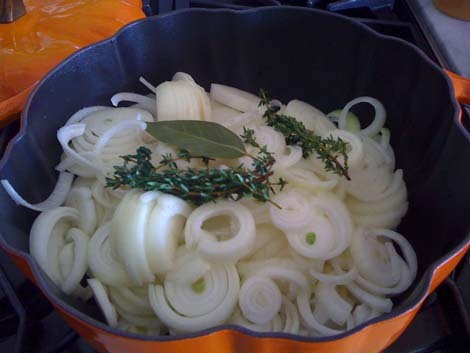 In a dutch oven, put your onions, butter, olive oil, bay leaves and thyme. Bake covered for about an hour. Remove from oven and stir. The onions should be nicely browned but not 100% caramelized yet. Put back in oven for another 30-60 minutes until caramelized. On top of the stove on medium heat, add the sherry to deglaze the pan, then add the beef broth and cook for another 20 minutes or so. You are now ready to make the individual servings. In oven proof soup bowls, add the soup, a crusty piece of bread and a generous amount of grated gruyere to cove the entire top. Place under broiler and remove when cheese is melted and golden. Inspired by Elizabeth Bard's Lunch in Paris, I am now addicted to onion soup and its simplicity. Her tip was to caramelize the onions in the oven and it works magically and effortlessly while filling the house with a heavenly aroma. I added more onions and I make my beef stock with beef bones but store-bought broth works wonders. Experiment with cheeses. Many people don't like gruyere. Swiss cheese works and cheddar adds a smooth mellow flavor. Don't leave out the sherry - it is the secret ingredient that makes the soup extra special!! For gluten intolerants - leave out the bread - the cheese still melts and adds the desired effect.